KOKOMO, Ind. – With the skies finally cleared after a rainy week, the David A. Kasey Memorial Youth Baseball Tournament finally climaxed at Eastside Youth Baseball League. 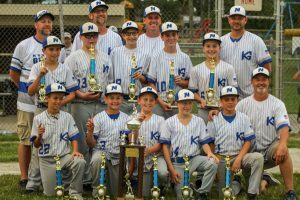 For the second consecutive season, it was a Northwestern squad that carried home the championship trophy – this time, Kokomo Grain captured its first tourney title with a thrilling come-from-behind 5-4 win over Southside’s Quality Plumbing and Heating. QPH (19-8) jumped to a 4-1 lead in the third thanks in part to a Jerome Konopa RBI double and a Ryan Catt two-run single. Grayson Keufner added an RBI when he walked with the bases loaded. But Kokomo Grain scored four of its own in the bottom half of the inning to take a 5-4 lead – a lead that would hold through the final out of the game. Lincoln Cardwell’s single trimmed the lead to 4-3, then Cardwell scored his second run of the games, this one to tie the contest on a Graham Bagwell one-bagger. Bagwell then scored the eventual game-winning run on a QPH throwing error. While the bats came to life in the third, it was the Kokomo Grain (23-2) bullpen that sealed the deal. And it was done in an unlikely fashion as the squad brought in No. 4 pitcher Maddox Hunley. The young hurler got Grain out of the third inning jam by entering the game with the bases loaded and getting the much-needed out. Then, over the next three innings, Maddox shut down the QPH attack by retiring 10 of the 12 batters he faced to earn the victory. Andrew Guerre, Hunley and Sammy Shotwell added base hits for the champions, who were managed by Mark Cothern. The win was the seventh Kasey Tourney championship for Northwestern as a league. For QPH, managed by Jim Griggs, Konopa and Logan Dockemeyer had two hits each and J.J. Gillespie had a single.